Earlier this week Sarah Palin was on Laura Ingraham’s radio show and once again she was not making sense. Hold the phone, are we talking about the same government here? Perhaps Mrs. Palin doesn’t realize that it’s our very own government who subsidizes the non-nutritious junk food way more than healthy fruits and vegetables. Or that so many of our government officials in the USDA also have held major appointments at some of the largest agribusinesses in the country. Or that it’s the same government who chooses to our children frozen pizza for breakfast. Oh, my. I’m going to stop now. Entry filed under: Food Policy, In The News. 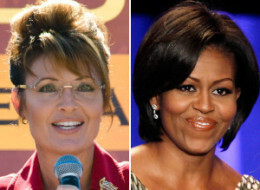 Tags: Food Policy, Laura Ingraham, Michelle Obama, Sarah Palin. Why does she continue to make stupid attacks? I mean, there are legitimate issues she could talk about, but complaining that our First Lady cares about what our kids eat? I’ve got to side with Michelle on this one, and it’s not even close.